GeorgeOrwellLibrary is a Legacy Library. Legacy libraries are the personal libraries of famous readers, entered by LibraryThing members from the Legacy Libraries group. GeorgeOrwellLibrary is also an author. 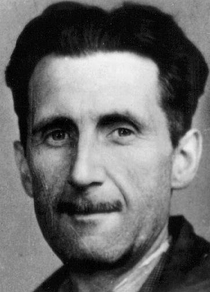 » See George Orwell's author page. About meGreorge Orwell was the better-known pen name of Eric Arthur Blair (25 June 1903 – 21 January 1950). Orwell's work was infused with a "profound consciousness of social injustice", and an intense rejection of totalitarianism. He is considered by some as "perhaps the 20th century’s best chronicler of English culture". His written works include fiction, polemics, journalism, memoir and critical essays. The two works he is most well known for are the novels "Animal Farm" (1945) and "Nineteen Eighty-Four" (1949). About my libraryThe original list of books comes from "Our Job is to Make Life Worth Living" by George Orwell Edited by Peter Davison Assisted by Ian Angus and Sheila Davison. It is a list of books believed to have been owned by Orwell at his time of death. The list is probably incomplete and may contain books that were not Orwell's. Orwell stated in his "Books v. Cigarettes" article to the Tribune on the 8th of February 1946 that his library consisted of around 900 books. This library contains 389 book that certainly belonged to Orwell and 134 that are questionable (noted as 'questionable' via tag and comment). The comments also contain information as to whom the books were distributed to after Orwell death - 'S-' for Sonia (Sonia Orwell), 'R-' for Rees (Richard Rees), and 'A-' for Avril (Mrs. William Dunn, Orwell's sister). Although the publication year was given in most of the entries it was often impossible to determine the exact edition of the work. In such cases the work was added manually so as not to included erroneous data.